I have added new information about sizing titanium at the end of the post, May 25th 2018. "Don't buy titanium or tungsten wedding bands." The Five Reasons I Say, "Don’t Buy Titanium or Tungsten Wedding Bands"
1. Your fingers will change size over the life of your wedding rings. Titanium and Tungsten are not solderable or sizable. 2. Gold and platinum rings can be sized, repaired, soldered on and changed. Again and again. 3. 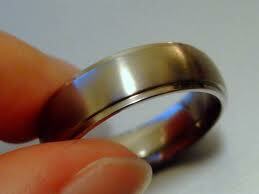 Gold and platinum have actual value as metals and go back through history as wedding ring metals. Titanium and Tungsen are cheap. 4. Your wedding ring stands for your commitment and your love and your future. You don’t want to toss your ring in the trash and order a new one every time your finger size changes. 5. Your wedding rings are the most important jewelry you’ll ever have. Your kids will inherit your wedding jewelry. Choose a valuable, special metal like gold or platinum. Titanium and tungsten are almost impossible to work with. I can almost guarantee there’s nobody in your hometown able to size a titanium or tungsten ring. Call around and see for yourself. You might get lucky and find someone on the internet located in the middle of North Dakota who says he can do the job. Good luck. 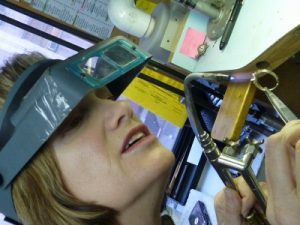 Gold and platinum can be soldered and sized and fixed by jewelers the world over. Ten years from now, when you’re ten years older, and your finger is two sizes larger, you’ll easily be able to size up your gold or platinum ring. 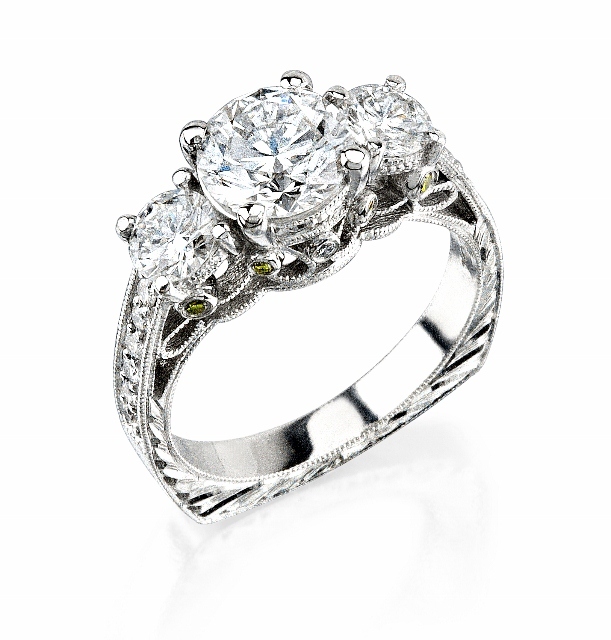 Want to replace your smaller center diamond with something bigger? No problem. Need to retip your worn prongs? Again, not a problem. Know this: your finger size will change. They always do over time. Our knuckles continue to grow even if the rest of our body doesn’t. Weight gain often accompanies pregnancy. On the flip side, you may have reason to size your rings down. Finger sizes change. 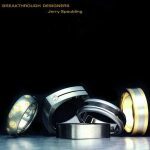 Will your titanium and tungsten wedding bands change with you? Nope. 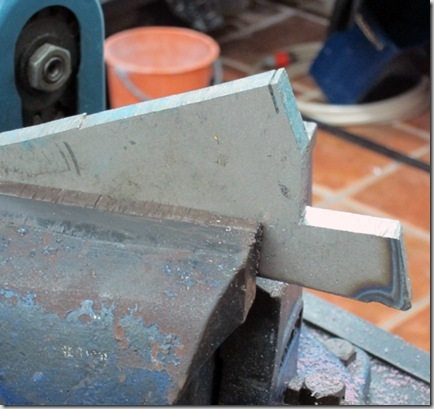 The titanium slab shown is filed, sawed and drilled. Not cast or soldered. It's worked in a machine shop, not a jeweler's bench. Gold and platinum are the traditional, go-to wedding ring materials. Unlike titanium and tungsten, they’re valuable metals. They are called "Noble Metals." They have been valued for thousands of years. The Egyptians, the Chinese, the Incas, the Mayans, and every other civilization on the planet have always valued gold. Gold and platinum are heavier, too, especially platinum! I like the weightiness of them! Unlike the lightweight, titanium, gold and platinum feel substantial and more precious. 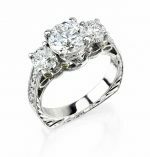 Your Magic and Meaningful Wedding Rings! A wedding ring is like a talisman—an object, like a stone or a jewel, thought to give magical powers to the person that carried or wore it. Your wedding ring is more than just a symbol saying “I’m married.” It’s like the talisman. It protects the union and wards off someone coming between you and your spouse. It guards against the evil spirits of divorce. I don’t know about you, but in my universe the more valuable the talisman, the more valuable the magic. Get a Good Wedding Band with Value and Versatility in it! Getting married? 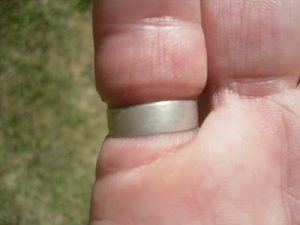 Don’t Buy Titanium and Tungsten Wedding Bands. Get a gold or platinum ring. Leave the titanium and tungsten for your right hand. Or break it out to go hiking. But for the ring that represents your union and your love don’t go cheap and temporary. Get the metal that represents lasting value and lasting love. Get wedding bands you can pass on to your kids. For your love, for the changing finger sizes in your married life, chose gold and platinum. Your love is worth it! A man taking a bath had his finger swell and went to the hospital to have his ring removed. They couldn't do it initially. He ended up in the hospital overnight. "Hi Mack, I just thought I would mention that I saw a potential hazard in using aircraft grade (6al-4v) titanium some 28 years ago when I first introduced titanium and stainless steel wedding bands, and within the first month switched to a very specific grade of titanium that could still be cut with a standard carbon-steel bladed ring cutter like a 'Beaver' brand ring cutter. In addition, I can stretch or compression-size nearly all my models and have taken them as far as two full sizes without any 'orange-peeling' Sizing requires many tons of force but I do it routinely. I've seen a lot of bad titanium bands that I feel are unsafe and that cannot be sized. I still won't sell alternate bands. But I'd say if you want one go to Jerry. His alternate metal bands are made with the viewpoint that jewelers have, of beauty, safety and alter ability. I respect that. Wow! What a useful article! 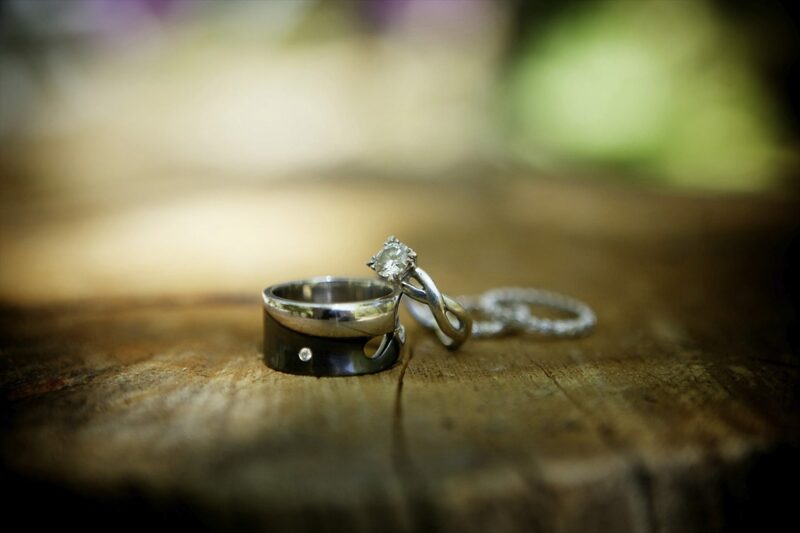 As professional wedding videographers I have had the pleasure of filming countless wedding rings of all shapes and sizes. Personally, I feel there is nothing like a beautiful gold or platinum ring and this article just reinforced my feeling about that! Thank you for bringing us these incredible insights Calla! They are greatly appreciated! Great blog Calla…Personally, I agree with you and would only give my husband (to be) Platinum. Thanks for your informative and passionate posts!!! Keep up the awesome work. That custom ring you made is absolutely out of this world gorgeous!!! Always a fan of platinum and gold. Will share this info. I have always been a gold or platinum girl , yet men seem to like the titanium, must be a golf thing? ! Great for a club but not to wear as a wedding ring. Why don’t men get that? Good info! Thanks Calla! Calla-I agree with Lynn that Titanium and Tungsten are here to stay-for eyeglasses.. not a precious wedding ring. Great advice! Tungsten wedding rings break very easily also! I’m upset enough about it that I started a petition. 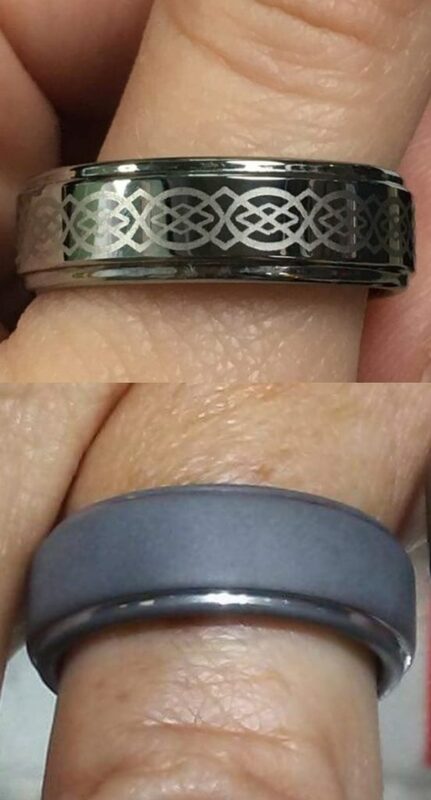 Calla Gold Jewelry, thank you for your blog post on the inappropriateness of Tungsten Bands for representing the sentiment of your marriage. Calla, please like this page on Facebook to let everyone know the truth about tungsten rings. The information shared here regarding Tungsten men wedding rings is very good. I think it is the most important thing to have wonderful designs. Thanks! Ridiculous. Just more way for a jeweler to make money. My husband works with metals,and titanium is very durable, strong, and lasts much longer than a gold, diamond band. Better metals and much less expensive. It’s not the band, it’s the bond that counts!!! 1) You didn’t list 5 reasons, you listed the same reason five different ways! 3) While it is true that tungsten can’t be resized, you’re wrong about titanium… likely not as easily as gold but it can be. Have you ever tried on a Tungsten ring? I doubt it, otherwise you would know that it is the opposite of lightweight. It is heavier than gold and closer to platinum in density. Being lightweight is a fair criticism of titanium, but you should amend your article so as not to mislead readers about the weight and feel of tungsten.